1. It contains at least two female characters. 3. They talk to each other about something other than a man. 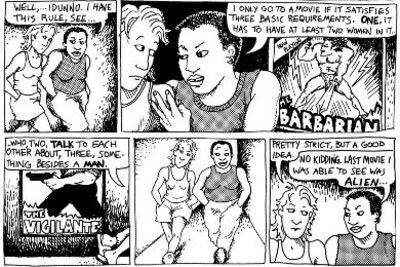 The Bechdel Test is not an assessment of the quality of the movie since it doesn't say anything about the quality of the writing , acting, direction etc. It just gives an idea of gender bias. Many great movies fail the test, and there might be terrible movies that pass. Most Hollywood blockbusters fail. How many movies can you think of that pass? I'm sure that there are loads of films that pass; the problem is thinking of them off the top of your head. Since I have just seen Annabelle, I know that one passes, as does The Wizard of Oz, Chicken Run (do hens count? ), the first two Narnia films (do children count? ), Cinderella, 101 Dalmatians, and Frozen. Very amusing! I can see how most Hollywood movies would fail! I watched Tankgirl recently, that might pass?